With summer behind us, we can finally say goodbye to the intense heat we had to endure. There were times over the last several months where it felt as though it would never be cool again. As a result, if you are like most homeowners, you gave your air conditioning unit quite a workout. Hopefully, it provided you with the comfort you needed. But, if it didn’t now’s the time to get it looked at by a Winston Salem air conditioning repair company. Additionally, even if you haven’t noticed any decrease in performance, you should have a technician inspect it now. Most importantly, you want to know that it will work properly when you need it again! Why Should I Worry About My AC with Cool Weather Coming? This is a good question. Chances are you will not use your AC much – if at all – for quite some time. But, this is precisely why you should have it serviced. Once those first chilly nights get here, you will not give your air conditioning system another thought. You will probably be thinking about grabbing a blanket and turning the heat up. However, you should remember that our cold weather season is not usually that long. Once April rolls around, you will probably need your AC again. While you are still thinking about it, you should get in touch with a Winston Salem air conditioning repair company. 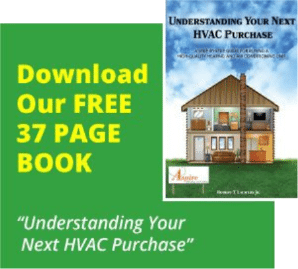 Get the pros out to your home to take a look at your system. They will be able to identify and fix any problems. Then, when that hot weather comes back, you will not have to do anything except turn on your AC system. Then, you’ll know that it will work properly. We know it can be difficult thinking about spring and summer with Halloween looming. But you will truly do yourself a favor if you have your AC serviced now. And, you can rely on the pros at Aspire to make any necessary repairs. For a free quote, call the air conditioning Winston Salem NC experts at 336-936-9111. You can also fill out our online contact form. We are a veteran-owned company and all military veterans and seniors receive discounts on service calls.